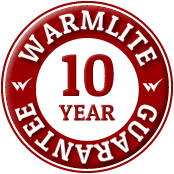 All Warmlite conservatory, window and door installations are covered by our 10 year guarantee. Additionally, our customers have the benefit of an insurance backed guarantee, provided by the Glass and Glazing Federation Insurance scheme (GGFi). This means that should Warmlite cease to trade for any reason, any guarantee claim you may make will be covered. For further information about our 10 year guarantee or to arrange a free site survey with a no obligation quotation.